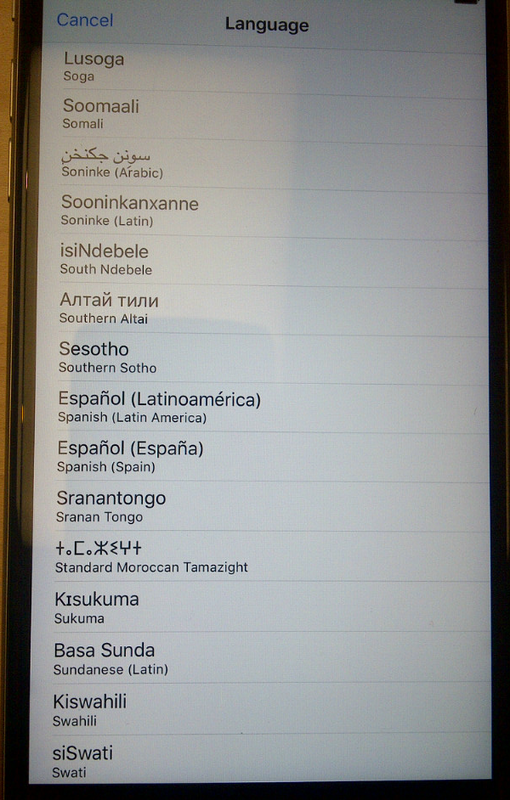 Pursuant to mention in the previous post about support for African languages on Apple's iPhone6s+ (iOS 9), I wanted to take a moment to list what those languages are. Again, there is not full support for any of them as far as I checked, but the list seems to be the most extensive list on any smartphone / mobile device available. Given the high cost of iPhones, however, even the less-expensive models are still upmarket items (see a discussion of relative cost per income of iPhone 5c in China, India, and Africa). So the benefits of Apple's apparent commitment to localization in African languages will not accrue directly to most people, though it may help raise the bar for other systems. English names as used on the iPhone were retained for this list; in a few cases, additional names have been added for clarity. Listings for the two languages that are offered each in two different scripts were consolidated (Arabic & Latin for Soninke, and Latin & Vai for Vai). 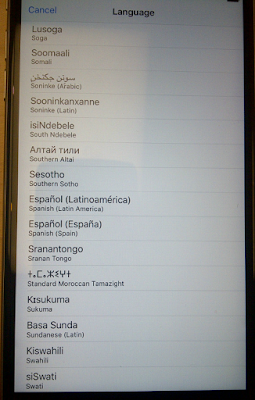 Notice different approach to Songhay language(s) in Firefox OS (previous posting), which is localized for "Songhay," and iPhone, which follows Ethnologue and ISO 639-3 listing "Koyra Chiini" and "Koyraboro Senni" separately (as well as "Zarma"). Would be interesting to know how these efforts compare. I did not find some major languages on the list, such as Amharic, Hausa, Kongo, and Tigrinya. The languages that are in the list include some that are very widely spoken and/or official, and some that are less-widely spoken - this may be a function of response to Apple's encouragement of developers to localize more apps rather than a planned approach (seeking more information). * The 18 countries not on the list (which had last been updated on 6 Nov. 2015 at time of access) are: Benin, Burundi, Cape Verde, Comoros, Djibouti, Equatorial Guinea, Eritrea, Ethiopia, Gambia, Lesotho, Liberia, Mauritania, Sao Tome e Principe, Seychelles, Somalia, South Sudan, Sudan, and Swaziland.